The marketing translation is private-cloud, hybrid-cloud, and public-cloud. I know, it is both a frustratingly noncommittal response and a lazy answer at best, but unfortunately, this is the world we live in today. Why? Because (warning controversial statement) “The Cloud” is still very early in its maturity stage and making long term decisions based on something that is in constant flux is difficult. Even further, your envrionment is nothing like anyone else’s so every evaluation point is literally a unique variable in the decision process. This means every choice you make is pretty much a guess. Does the team have enough cycles to learn about, understand, and compare all the different options in the market while keeping up with their daily responsibilities? If not, can you dedicate the appropriate amount of resources (people and/or money) to fully architect, deploy, and maintain an environment on time and within a set budget? Is your primary business in developing and deploying applications? If not, do you plan on moving in that direction? Will there be a chance to monetize the solution or expand into a new market? Do you already have enough in your environment to modify to meet your near term requirements? Can someone else do it for less cost at the same or better quality? What is the backup plan or “get well” strategy if someone else cannot deliver on promised SLA’s? What is your tolerance for risk? Can you demonstrate accurately the operation cost of keeping your infrastructure on premise vs. moving it to a hosted provider? Second step then is to look at this answers and assess if it meets desired outcomes and goals. If it does, you have a great jumping off point. If it doesn’t, you need to continue to ask questions. One thing I do want to make clear is that these questions are not trying to steer the conversation into any one particular solution. Like I mentioned above there are several ways to solve this challenge and making the best recommendation always comes down to digging in and finding out as much information as possible and try to make the most educated guess as possible. Remember, no solution is ever perfect, but asking tough and sometimes uncomfortable questions will provide a good starting point for you to move in the right direction! One of the best parts of my job is getting to see all the new technologies and the major shifts in the industry. If you have been in the IT field over the last couple years it has been accelerating at what I would label an insane pace. Even in the last couple months alone it feels like there has been a new tidal wave of major transformations emerging all at once. While we (I) can get excited about the prospects of advancements like all-flash SAN’s, new OpenStack platforms, and software defined data-centers there still is an overwhelming feeling of “the unknown” when evaluating these products. As hard we try most of us cannot predict the future yet are asked to make very difficult decisions that have very long consequences. The ask from the business is to make pragmatic choices in what I would call a highly stressful fast moving emotionally charged environment with little to no information. Often I get asked how do other people/companies navigate this world of constant change and, lets face it, vague or misleading marketing information? My answer is you don’t. At the end of the day it is all blind guess work and just like everyone else it is trying to make the best decision possible with the information we have available. Remember, no decision is ever truly perfect. However, I do think there are some ways to help narrow down possible choices and build some repeatable frameworks around the decision process. How can we the organization (if possible) avoid all risk together? If we cannot how do we limit or mitigate the impact of the potential risk? Are there action we can take to reduce this potential risk? Can we share this risk with other parties (Vendors, other business units, partnerships etc.)? Finally, once we factor in these identified risks is the appropriate costs/reward involved to warrant this risk? I must warn you this process can and will sometimes slow down or kill a project which is never a popular outcome. Still, I believe the benefits outweigh the negatives and can help provide some much needed peace of mind or more likely some protection if things go terribly wrong. Best practices would have you not only internally evaluate these questions with your team but also ask for responses from the potential vendors and other external partners involved. Hold them accountable for sharing known risk that are involved with their product(s). They may bring up things (good or bad) you didn’t even think about. Document these responses and use them as part of your overall decision criteria. Keep these on file and make sure to reference back as you evaluate if your solution was a failure or hopefully a success. Recently the topic of “Technical Debt” came up during a project planning meeting with a customer. If you have never heard the term before I am not surprised. Although it is an important and a key metric to track it is rarely discussed or addressed. Originally coined in regards to traditional software development (also known as design debt or code debt) technical debt simply refers to amount of work that is still owed to the business before a group can call a project complete. It is important to know what this debt is because much like real financial debt (think credit cards) it can increase with interest over time and this interest has a compounding effect. Once you get behind on deployment keeping everything running and patched begins to become a huge challenge demanding more and more resources. Scale, adding new features and providing agility begins to become very difficult. More often than not this liability is never truly paid back. Sooner or later the business decides to write it off and start again with a new project. Unfortunately I see repeating behaviors and can almost conclude without a doubt that the next project will suffer the same fate. First and foremost take ownership of the project and have proper understanding of the outcome and desired results. When the scope of the project is defined there is no doubt on the expectations for a successful launch. This also gives you the baseline or true cost to measure future debt against. Second, take larger projects and break them down into the smallest deployments possible. Then develop these small deployments into repeatable operations that can be automated. Create feedback loops so you can make adjustments on the smaller deployments as quickly as possible. By the time you need to make an pivot on a larger rollout it is too late. Third be consistently ruthless in removing waste. Inefficiencies will destroy any hopes of a successful project. Know your resources (strengths and weakness), potential bottlenecks and distractions. Finally, don’t be afraid of failing or admitting a mistake. Not all projects turn out the way we plan and sooner or later a change is in store. It is better to admit this and make adjustments than to follow course. More times than not when I hear of a failed project there always seems to be awareness early on that something is not going correctly. Either did I! Leveraging the GPU on the vSphere host it is possible to take advantage of performance acceleration. Using a guest five the entire Linux graphics stack can benefit from this improvement. Best part of all…VMware is releasing the driver code to the open-source community allowing for out of the box support reducing the need for addition tools and package installation. Note: This Compatibility Guide will always contain the most up to date information. Use as your primary source to verify 3D support for a guest operating system. Use this article as a secondary source. Note: Linux virtual machines do not include Horizon View support. Just a quick update on what was released with version 5.5 in regards to networking enhancements. Training, professional service or do it yourself (DYI)? This is becoming a very common question for most of my clients and I would guess for the industry as a whole. While I am speaking specifically of virtualization (hypervisor), this of course could apply to many aspects of the current data center. So what is an IT team supposed to do? When does a system administrator admit he/she cannot complete task at head and in a way stick his own neck out? Where does budgets come into place vs. deliverables such as timelines, service levels etc? All very interesting questions, but answers are a bit complex. Personally I am proponent of education in all aspect of like not just the technical side. However, training has some serious drawbacks and may not be a true option when looked at carefully. For one it is much more time consuming than most people realize or maybe want to admit. Plus ones absorption rate varies widely between individuals. I know people who touch something once and are “experts” while on the other hand people who have done the same thing a hundred times still needs reminders how to finish the task. Not to mention that the individual trainer/provider makes a huge difference. Lastly, classes usually require time away from the office and can put a person in a worst situation than before trying to catch up and learn new stuff at the same time. With that said, there is a huge upside here. This learn to fish mentality provides higher adoption rate, customer satisfaction and allows the customer be less dependent on a particular partner or vendor. All in my opinion can be a huge value add for getting some classroom & lab time. Of course I want to be careful here since I work for a professional service (PS) company. The drawbacks are nothing new. It tends to be expensive and add up to 30% to projects budget. Managing the PS partner at times can be difficult and a time waste almost breaking even with doing it yourself. Plus, and it is a big plus, it puts the requestor in a vulnerable position with both his management and the PS partner. One, he/she s vouching for this service and in a way sticking their respected necks out while at the same time admitting they don’t have the capacity to do this themselves. The PS partner thinks they are dependent on them and lets be honest most of the time they are, and tend to use that to their advantage whether they do good work or not. The good news if that you find a good partner most of these problems solve themselves. Value partners will not only do the work but train you as they move through the process meeting SLA’s and budgets. They will do their work in a timely manner putting your project ahead of schedule and make you the advocate look like a rock star. They are fair on price and try to work within your budget range and adapt as needed. Finally, someone else is on the hook and can, good or bad, be a scapegoat if the project ever goes sideways. Food for thought. My favorite because it tends to be my motto but tends to get me in trouble more often than not. For one if you are lacking the base foundation of skillsets you could end up costing yourself a lot more time and money than expected. With that I mean, It tends not to be a good use of company resources and your time could be better used doing the tasks you’re a good at. And then the biggest negative, and I see this every working day of my career, is that it isn’t done right and causes huge headaches in the short or long term. Poor performance almost always boils down to bad infrastructure designs that a quality PS partner would have avoided in the beginning. However there are some upside to the DIY approach. For instance people tend to learn best by doing and it pushes you to expand your knowledge. The cost aspect if avoiding the above mistakes can be huge and set up a dependence that is unmatched. You own the keys to your data center and no one is driving but you! This is a huge advantage when negotiating with vendors, partners, and even management. Lastly, It provides you the best job security I could imagine. As the designer and implementer you become almost irreplaceable as no one wants to reverse engineer your solutions. Now granted this is only the case if it is done right and you don’t cause a huge outage. In the end I tell clients a mixture of all of these tends to be the best fit. Of course depending on the scope and product I do recommend certain avenues. If it is tier 1 and 99.999 uptime application then by all means spending a few dollars here and there would be a great investment to ensure success. If it is a low priority project that needs little success and are not under a time crunch then it is great to roll up your sleeves and get to work. The one thing I will say is that education and classes should be included with every project. If you are not learning how things work you will always be susceptible to be vendor locked, and no one wants that except the vendors. 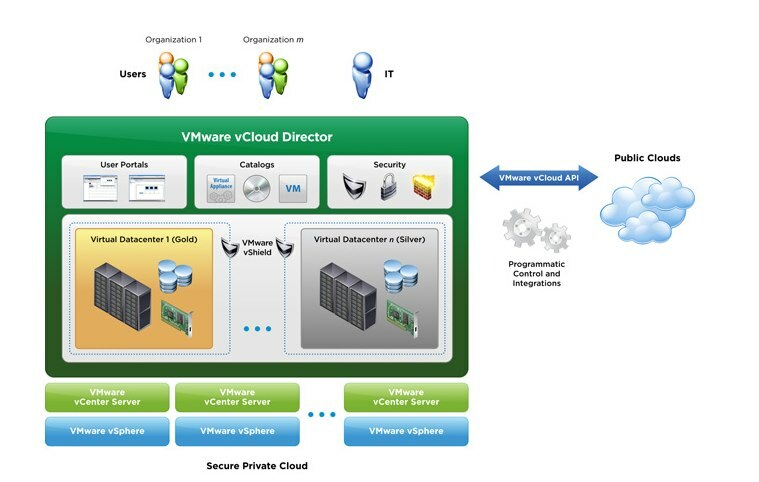 Part of the big announcements prior to VMworld this year was the announcement of vCloud Director 1.5. If you haven’t heard of vCloud director it was popularly known in the past as VMware Lab Manager (RIP). With version 1 under its belt VMware is releasing version 1.5 and added a few new features. Below are a few of the most important (in my humble opinion) that will have the greatest impact for people already on vCloud Director. First, and I am really excited about this, is the addition of Fast Provisioning. This feature uses linked clones so you can provision VMs from a template rather a full copy. This will allow for provisioning of a VM in seconds vs. who knows how long and will help cut your storage cost significantly. NetApp does something similar if you haven’t seen their product, I would check it out as well. Second, they increased the enhancements of the vCloud API. This helps fit vCloud into existing environments with baked IT management tools. With added messaging it will be able to provide notifications to your various systems; backup, monitoring, CMDB, IPAM, and network tools for example. There is also some new SDK’s coming and better use of query service. Third, they added a significant increase in support for their Microsoft SQL Database. You can actually build a vCloud Director environment using a Microsoft SQL database for all of the configuration data, which will help if you are highly invested in a Microsoft SQL database. Now you can get rid of that Oracle License you been hanging on to. Lastly, I wanted to touch on the expansion of vShield support and will be integrating with IPSec VPN and added Firewall capabilities. More details to come on this, but know that when setting up secure cloud environments that there will be secure ways to connect external-internal cloud through a secure interface. Think DR and onsite cloud sites synching. More to come, but excited to see this product line evolve. Over the last couple weeks a very common question I am getting from customers is around switching off of VMware and onto another hypervisor. Usually when we go through the exercise to determine if this is something within their comfort zone we find quickly that the idea of rip and replace is much more of a burden than keeping the current infrastructure. But with that said, things are a changing and people are looking at a plan B so they are not married to a specific vendor incase of some sort of dramatic change, lets say pricing or feature set for example. Until recently I could honestly say there wasn’t any alternatives that we would recommend that was apples to apples in features and scalability etc. 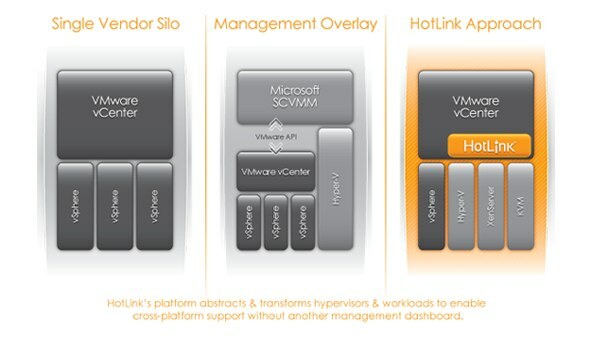 Plus, even if a customer moved to a lateral competitor (Citrix or Hyper-v) they same “locked in” situation would occur. Now, only if there was a product that could manage all the different types of hyper-visors with the best of bread management software on a single platform? Well we are all in luck because there is a new company that promises to help with this situation. Hotlink was founded last year and will be launching their new product, Hotlink SuperVISOR, very soon and I can say looking over their spec sheets that I am excited to see if this will be as advertised! In its simplest form it is a layer that sits in-between the hypervisor layer and your management console (vCenter for example). Using their unique tools set including virtual object bus, transformation technology, proxy and integration services it allows for heterogeneous environment. This means, good or bad, you can run a multitude of different hypervisors under one single platform. One thing that I do like about this technology is that it does take advantage of your best of breed products. For example, its first management plugin is designed for VMware vCenter and looking over the feature set this is a wise decision. Customer familiar with working in this management console will find the transition smooth with little to no disruption allowing them to leverage existing skills. 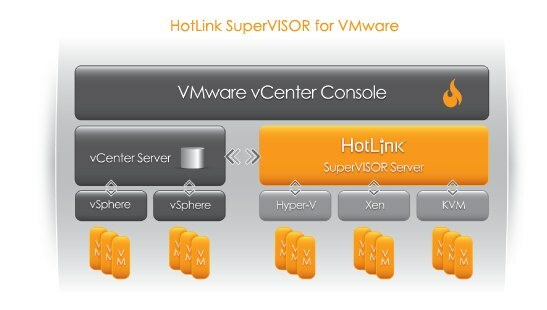 As well, you can now mix and match your hypervisors to match your application needs. This both increases efficiency and decreases cost as you put enterprise class programs on VMWare which is expensive and put tier 3 applications on Hyper-v which is less expensive. This puts you in a position to avoid vendor lock-in and if you are already running multiple hypervisors provide a single management console reducing your opex. I want to be careful when pointing out good vs. bad when reviewing this product because to be transparent I haven’t seen a demo copy or tested it in the lab as of yet. So instead I just have a lot of questions about the functionality, performance and other technical details. For starters, I am not sure on the performance overhead of my host machines? I don’t know what this does to my environment if lets say I structurally built around VMware now running several different products under the same hood? I don’t know how this would affect my storage infrastructure and included API’s from EMC, NetApp, etc? Design, deployment, troubleshooting are all questions at this point. This is just the tip of the iceberg. I will say I would be a bit nervous putting this layer in my environment without a firm understanding of all impacts it would put on my infrastructure. It still won’t address any licensing issues around cost reduction. True you could say move your file servers to Hyper-v which is free with Windows server licenses and only keep your primary machines under VMware but that falls into the 80/20 principle and willing to bet that most of your production applications are high to mission critical and cannot afford any downtime, which is why people move to VMware and pay the extra premium. However it could help lead down the path were you could give VMware a solid threat to migrate and have a powerful tool at your disposal. The base price for the SuperVISOR platform is $25k, which includes support for vSphere + 1 other hypervisor and 5 hosts. That is all the details I have at this point. As I hear more I will update this posting. Overall this is a great step forward and depending on execution could change the virtualization landscape. I would assume that there will be a group of similar products over the next couple months as this idea gains traction. So I will be curious to see how fast Hotlink can move to market and get adoption going. Looking to seeing more updates. 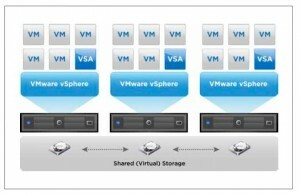 When VMware announced vSphere 5 they mentioned a new storage appliance called VSA or vSphere Storage Appliance (VSA). It is intended to be used by smaller VMware environments who don’t/didn’t have a SAN or NAS array at their disposal. You know, because SAN’s are expensive, complex and such. Prior to this you could still deploy vSphere but you were heavily limited on the things that made vSphere so cool; vMotion, and HA for example. That Sounds Nifty, how does that work? It simply makes use of your server’s internal hard drives as a pooled shared resourced, pretty simple really. Here is some more detail. 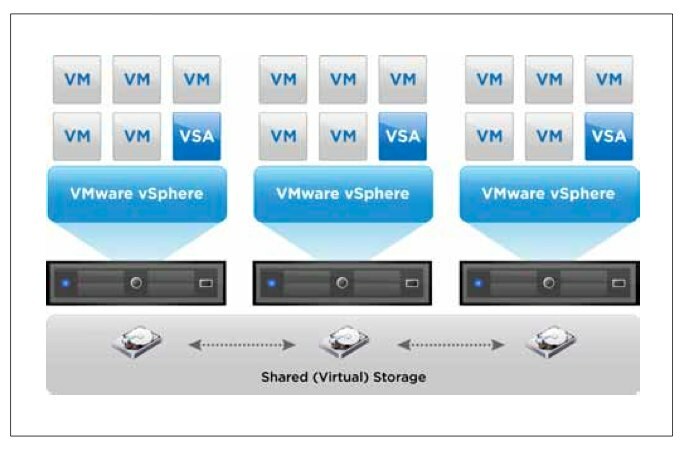 For every ESXi server you will have a VSA deployed to it as a virtual machine. Making use of the available of the local disk (those hard drives that came with your server) on the ESXi host and it will pool these together and provide a replicated NFS volume for the ESXi server. Once you do this on several hosts, then you should have a highly resilient storage backup system, since it will replicate these across all of the hosts providing a clustered and shared data store across all of your hosts. Make sense? Help lower CapEx and OpEx for your IT department, this is huge! Some rather unique custom settings: RAID 10, RAID 1, replacement of Node in case of failure. So does this mean you can kick EMC and NetApp to the curb? Sorry not yet, keep writing those big checks but it will help in a variety of different scenarios. Any remote location or branch office where you used to put a small SAN is a perfect example. Just simply beef up the hard drives on your servers and use those hosts as pooled storage. Lab Environments are literately perfect for this. Now instead of waiting for some ancient hardware to come your way or beg management for a little money you can have a fully functioning SAN in your environment. Very Small environments work great too, but just know this isn’t a permanent solution as of yet and wouldn’t replace a fully robust storage platform. This isn’t really a new idea, virtual iSCSI appliances have been around awhile and network RAID isn’t new either, LeftHand. But what it is doing is removing external needs for a VMware environment. By taking away the need for a 3rd party storage device it shortens the deployment time for your virtual environment. I highly doubt that this is the last involvement that VMware will have with storage and see them providing much more significant tools for managing your virtual information. More to come. For a Technical indepth view, take a look at this link. 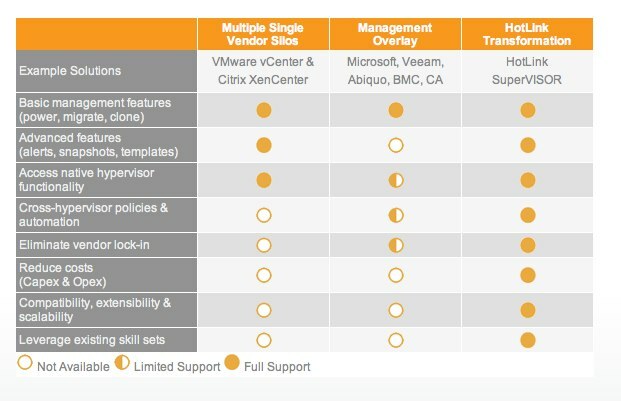 Still don’t understand the new vSphere licensing model? Can’t quite comprehend what you are entitled to from your existing vSphere environment? Need hard cost proof why you should or shouldn’t upgrade to vSphere 5? Tired of all of these rhetorical questions? 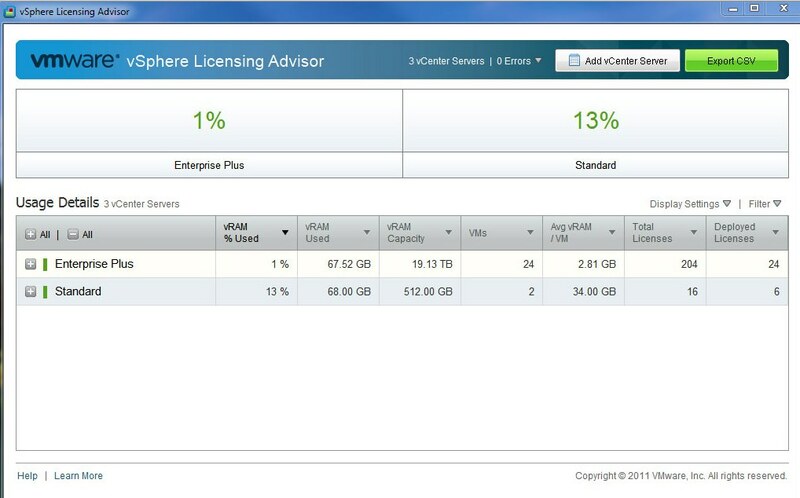 Good news below is a link to VMware’s vSphere Licensing Advisor. This is a tool that will let you to look at your 4.1, 4.0, or 3.5 environments and see what you are entitled to. The tool requires JRE 1.6 or higher. Editions are displayed as their vSphere 5.0 equivalents using standard entitlement paths. If you have vCenter Servers in linked mode, you will need to connect to each vCenter Server. The tool displays vRAM usage and capacity at the single point in time the data is gathered. The tool will work in environments with Virtual Infrastructure 3.5, vSphere 4.0 and vSphere 4.1. Environments with vCenter Server 4.x managing Virtual Infrastructure 3.5 hosts are not supported with this tool.